USC Price's Associated Students of Planning and Development (ASPD), in collaboration with GEAR UP 4 LA, hosted "Planning for College," a daylong event in which local high school students from the Robert F. Kennedy Community Schools had the opportunity to learn about the urban planning field and gain insights on the college admissions process. Photo by Julie Kim and Deirdre Flanagan. The USC Price School of Public Policy provides a dynamic learning environment where interdisciplinary education abounds. At USC Price, students choose a program of study from the independent yet related fields of public administration and leadership, public policy, nonprofits and philanthropy, health management and policy, urban planning, real estate development and executive leadership. Students are supported by a committed faculty who contribute to the strong sense of community present in the school. The school's mission is to improve the quality of life for people and their communities. Faculty engage in solving some of society's most pressing issues — and challenge students to do the same. USC Price is renowned for its expertise in areas such as: sustainability and the environment, health care policy, nonprofit management, housing and real estate, transportation, infrastructure, urban development and land use, social policy, governance, civic engagement, community development, immigration and risk analysis, among others. Defining characteristics of USC Price are the depth of its academic classroom experience and connecting classroom theory to professional practice through practicums, internships and laboratory work locally, nationally and around the globe. Students graduate with the knowledge, skills and experiences to lead in their chosen field of practice. Today's complex challenges call for leaders who are able to work across disciplines and across the public, private and nonprofit sectors to find solutions. 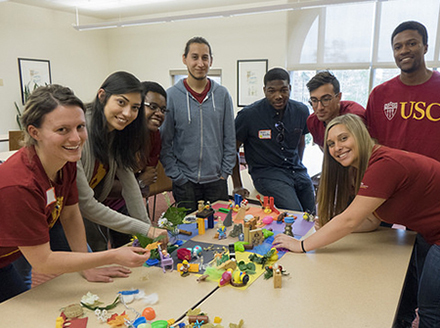 It is for this multidisciplinary reality that USC Price prepares its students. USC Price students go on to hold high-ranking appointments in our nation's capital, analyze and determine public policy, design new transportation systems, and redesign city, county, state and federal governance structures — in the United States and abroad. The Master of Planning is offered as a dual master's degree with programs in architecture, curatorial practices and the public sphere, landscape architecture, business administration, economics, gerontology, public administration, public health, public policy, real estate development and social work. The Master of Public Administration is offered as a dual master's degree with programs in planning, gerontology, Jewish nonprofit management, law and social work. The Master of Real Estate Development is offered as a dual degree with the Master of Business Administration, Juris Doctor and Master of Planning. The Master of Health Administration is offered as a dual degree with the Master of Science in Gerontology. The Master of Public Policy is offered as a dual degree with programs in law and planning. Pi Alpha Alpha is the national honor society for public affairs and administration. Graduate students in the Price School of Public Policy who have completed at least 18 semester units and have earned a 3.7 grade point average are eligible for membership. Pi Sigma Alpha is the national honor society for students in public administration, political science, and international relations. Students who have completed at least three courses from among these fields and have earned at least a 3.5 grade point average are eligible to apply. The Price School of Public Policy offers a suite of degrees that allow undergraduate students to gain the skills and knowledge necessary to understand complex health, environmental and urban issues, as well as to potentially enter the professional fields of health and nonprofit management, public policy, real estate development, and urban planning. Students may enroll in the Bachelor of Science in Public Policy, Bachelor of Science in Urban Studies and Planning or the Bachelor of Science in Real Estate Development. In addition, students can select from a challenging set of minors or possibly the very competitive progressive degrees associated with the Master of Health Administration, Master of Planning and Master of Public Administration. Freshman and transfer students may indicate their desire to declare a Price School major on their university application. Students enrolled at USC wishing to declare either Price major or to be admitted into the minors must be in good academic standing. Interested current USC students should contact the Admissions and Recruitment Office in RGL 111 for more information. Students must discuss courses of study with the appropriate undergraduate advisers throughout their college enrollment and need to develop their own individual programs with faculty and staff advisers at the time of first enrollment and throughout their college careers. The Price School of Public Policy offers students who have demonstrated exceptional academic success the opportunity to earn both bachelor's and master's degrees in a progressive degree program. This program allows students to earn both the Bachelor of Science and a master's degree in five years. Further details about progressive degrees can be found on the Requirements for Graduation page. Admission is available after the completion of 64 units of course work toward the undergraduate degree. Students must apply for admission to the progressive degree program after completing 64 units of applicable course work to their undergraduate programs, but prior to the completion of 96 units of course work (not including AP, IB or courses taken prior to high school graduation). The application for admission to the progressive degree plan must be accompanied by a course proposal plan and two letters of recommendation with one at least from a Price School faculty member. The Bachelor of Science and master's degree may be awarded separately upon completion of all degree requirements, but the master's degree will not be awarded before the bachelor's degree. Students who elect not to complete the master's, must complete 128 units to earn the bachelor's degree, including 32 units of upper-division Price course work (including any graduate Price classes). All requirements for the progressive degree must be completed within 12 semesters. If not completed within that time, students will no longer be eligible for the master's degree but may still earn the bachelor's. Graduate courses will not be accepted for transfer credit. Undergraduate classes may be transferred in accordance with university guidelines. This program covers the most current theories and practice of construction planning and management. The program provides a valuable adjunct credential to professional school students pursuing careers in business administration, public administration, environmental studies, and other areas; and a unique opportunity for professional focus to students in the USC Dornsife College of Letters, Arts and Sciences. Construction activities are complex. In contemporary society, effective planning and management of these activities requires specialized knowledge of the technical, economic and political environment. This program couples the knowledge of how construction activities are organized with a broader understanding of the urban system in which construction projects are embedded. With the exception of statistics, all of the required courses are within the Department of Civil Engineering and the Price School of Public Policy. Any USC undergraduate who has completed the equivalent of two full-time semesters in good standing is eligible to pursue the minor program. This minor program is rigorous enough to serve as an introductory credential for students subsequently electing to pursue advanced studies in development, urban planning, construction management or allied fields. See the Department of Civil Engineering for course requirements. The minor in international policy and management brings together courses from the School of International Relations, dealing with the new global challenges, specific regions of the world, and international organizations and policies, and the Price School of Public Policy, dealing with core management skills and public policy processes. Students will examine the changes and challenges which are transforming the world, and the policy and management skills used to deal with them. To increase their understanding of the context and application of these concepts, students must complete a semester-long internship either in Washington, D.C. (through participation in the Washington, D.C. semester program) or in Los Angeles with an organization that has an international focus. Students minoring in international policy and management take three courses in international relations, including the gateway course, IR 305w Managing New Global Problems ; three courses in public policy and management; and an approved internship through the School of International Relations ( IR 491x Field Study ). For additional course information, see International Relations . Applicants for admission to the Master of Health Administration; Executive Master of Health Administration; Executive Master of Leadership; Master of Nonprofit Management and Leadership; Master of Planning; Master of Planning and Development Studies; Master of Public Administration; Master of Public Policy; Master of Public Policy and Management; Master of Real Estate Development; Doctor of Policy, Planning, and Development; Doctor of Philosophy in Public Policy and Management; and Doctor of Philosophy in Urban Planning and Development must have a bachelor's degree or its equivalent from an accredited educational institution. In recognition of the increasing diversity of capabilities required as the theories and practices of policy, planning, and development evolve, students from a variety of undergraduate and graduate backgrounds are encouraged to apply. Applicants for admission will be expected to have completed a broad range of undergraduate courses in addition to their academic major or professional concentration. Generally, this will be reflected in completion of courses from the following fields: English; economics (basic theory); political science, history or sociology; physical or natural science; art or philosophy. In addition, mathematics (algebra, calculus, probability theory) and a course in statistics are strongly recommended. Admission to graduate programs in the Price School of Public Policy is highly selective and competitive. Preference is given to those with a record of high educational achievement and personal qualities favoring success in the fields of planning or development. Applicants must have achieved superior grades during undergraduate and any graduate education. A grade point average of at least 3.0 (A = 4.0) is normally expected as well as satisfactory scores on the Graduate Record Examinations (GRE). The GRE and GMAT are neither accepted nor required for the DPPD or executive MHA programs. Students applying for admission to the Master of Nonprofit Management and Leadership, Master of Planning, Master of Planning and Development Studies or the Master of Real Estate Development program may submit results from the Graduate Management Administration Test (GMAT). MRED applicants may also submit results from the Law School Admission Test (LSAT). In exceptional cases, an applicant who has not met these scholarship requirements may be admitted with conditions of admission. For specific information on admission requirements and application procedures, contact the Price School of Public Policy, Office of Recruitment and Admissions, at (213) 740-0550. Certificate in Transportation Systems applicants should apply to the USC Viterbi School of Engineering. For additional information, contact the school at (213) 740-0587. The Degree Progress Department determines whether work done elsewhere is available for consideration for credit toward the USC degree. That office requires official transcripts of all course work done before entering USC. A Graduate Transfer Credit Statement of these official transcripts, done after a student has been admitted to regular status at USC, will indicate which units are available for transfer. These courses do not apply toward the degree unless, and until, the student's major department approves and submits transfer credit to the Degree Progress Department in the Office of Academic Records and Registrar. Application of any available transfer credits toward a graduate degree will be determined by the director of the particular degree program, based on the semester units available for transfer as shown on the Transfer Credit Statement. These general guidelines are followed by the admissions evaluator and by faculty members: (1) the work must be completed at an accredited graduate school; (2) the grade must be B or better; (3) the work must be a fair and reasonable equivalent to current USC course work at the graduate level which fits into the logical program for the degree; (4) the units are not more than seven years old at the time of admission to their master's program (or 10 years old for a doctoral program); (5) the units must reflect current knowledge in the field; and (6) the work must be completed prior to admission to the USC program. USC does not give transfer credit for life experience, credit by examination, noncredit extension courses or thesis course supervision. Please consult with your degree director before enrolling in courses outside of USC. In many of the Price School's master's degree programs, only courses taken outside of USC prior to admission may be applied to your degree. The school recognizes that some applicants may have covered the material contained in core courses or courses required for a particular specialization. Under these circumstances, one particular course requirement may be waived, allowing the student to complete a more advanced course in the same area. Students who have a background in a particular area of study may be allowed to substitute other courses. In these situations students do not receive unit credit but are permitted to take course work, which does not repeat earlier academic experiences. Waiver of content is usually given only in the case of previous academic study of the subject, not in the case of experiential background in the area. Students who believe they are eligible for content waiver decisions must petition the faculty of the school, providing evidence of the previous work through transcripts, syllabi and other pertinent material. Contact the school's Student Affairs Office for information. This program is jointly sponsored by the Epstein Industrial and Systems Engineering Department and the Price School of Public Policy, and administered by the Epstein Industrial and Systems Engineering Department. This degree is designed for students with sufficiently quantitative bachelor's degrees in engineering, the sciences or applied social science who are interested in operations management and health care applications, and whose career objectives lead to increasing technical management responsibilities in large health care organizations, particularly hospitals. Students with less quantitative social science or other non-technical backgrounds interested in health administration objectives may also want to consider the Master of Health Administration program in the Price School of Public Policy. For information, see Industrial and Systems Engineering . USC's Price School of Public Policy offers professional consulting-like experience for graduate students in its core master's degree programs. Participants are presented with a challenging professional assignment and a well-defined client and terms of reference. Students typically work in teams to produce a professional report and related materials that are presented to the client at the close of the assignment. The terms of reference for the lab vary each year depending upon the client, the instructor and the setting, among other considerations. In principle, these professional labs may be held anywhere, either in Los Angeles, elsewhere in the United States or abroad. The Price School professional laboratory teaches students to integrate scholarly knowledge with professional practice. Likewise, it helps participants make the transition from the classroom back to a "real world" setting. In the case of international labs, participants also gain a deeper and more direct understanding of how the culture of professional practice can vary from one setting to the next. Through the Price School professional laboratory students build their credentials and experience while also extending their network of professional contacts. These professional labs are intended primarily for graduate students in public administration, planning, real estate development, public policy and health administration. A distinctive feature of the professional laboratory is that it is intended as an integrative professional experience across the school, so that students from any of these programs may participate fully. Each summer the Price School offers one or more international labs/workshops. Recent international labs have been held in China, Brazil, Germany, Morocco, Italy and Vietnam. All students are encouraged to take at least one international lab course. The Hertie School of Governance exchange program is a one-semester exchange program offered during the fall semester. The program will provide opportunities for students to acquire knowledge and skills necessary to become global leaders and succeed in a global market. All instruction is in English; proficiency in a foreign language is not required. Courses completed at the Hertie School of Governance are graded credit/no credit on the student's USC transcript. The courses are selected from a list approved by the Price School of Public Policy. Students must work with their program administrator to understand how the courses will return to their degree. This 17-unit graduate certificate is jointly sponsored by the Epstein Industrial and Systems Engineering Department and the Price School of Public Policy (Master of Health Administration program), and administered by the Epstein Industrial and Systems Engineering Department. See the Industrial and Systems Engineering Department for course requirements. This is a four-week intensive training program in the art and science of management. The program is designed to enhance leadership effectiveness and the development of a management generalist perspective. This five-week laboratory focuses on issues in executive leadership, strategic management, environmental analysis, international finance and economics, computer-based project planning, and implementation of planned change strategies. A dual degree program is an academic option that allows a student to enroll in two graduate programs simultaneously. Application must be made to both schools, and if accepted to both, the student pursues a specially designed program which combines selected courses from the two academic units. Students are required to seek advisement from both schools. The student will have the opportunity to acquire the knowledge and skills from two fields of study. The dual degree program enables the student to integrate a closely related field with planning or development. The purpose of the dual program is to provide an enriched educational experience; accordingly, concurrent course work in the two fields is required. Since the unit requirements of dual degrees depend upon the mutual transfer of units between the two academic units, no other transfer of credits will be allowed. Students who decide, at any point, to earn only one of the two degrees must meet all the regular requirements for earning that degree alone. Students in Master of Planning dual degree programs must fulfill the comprehensive examination and appropriate internship requirements except where noted otherwise. See the School of Architecture for degree requirements. The Master of Planning/Master of Advanced Architectural Studies dual degree program facilitates highly related cross-disciplinary studies in architecture and in planning at the master's level. This program offers students interested in developing a career in urban design an opportunity to make more substantial commitments in both disciplines and to achieve a more coherent and extensive knowledge in the design of built environments and public policy. This dual degree program normally requires five semesters in residence. Qualified students who are admitted to the graduate programs in both the School of Architecture and the USC Price School of Public Policy may complete both degrees in a highly integrated five-semester program. Such students must already possess a five-year professional degree in architecture. Requirements for completion of the dual degree program are 72 units, including 36 units in architecture and 36 units in planning. See the USC School of Architecture for course requirements. See the Marshall School of Business for degree requirements. See the Roski School of Art and Design for degree requirements. The dual degree option in planning and landscape architecture (in the USC School of Architecture) trains professionals in policy and design, and to be competent with design problems at different scales, but with a distinctly urban focus. Candidates must be independently admitted to the Master of Planning and Master of Landscape Architecture programs. The dual degree program normally requires between five and seven semesters in residence. Completion of the dual degree requires 24 units of courses in urban planning, 10 units of thesis option I or II and either 32 units of landscape architecture (for those students admitted with advanced standing); 48 units of landscape architecture (for those students admitted with advanced placement); or 74 units of landscape architecture (for those students admitted to the three-year curriculum). See USC School of Architecture for course requirements. See the USC Gould School of Law for degree requirements. For rules governing a second master's degree, see the Requirements for Graduation page. In accordance with these policies, transfer credits will be granted only on the basis of a written petition to the MPA program coordinator and on the basis of credits recognized by USC in a Transfer Credit Statement. Students may want to prepare for teaching as well as for public service. By careful planning in the upper division of the undergraduate degree and during the graduate years, requirements for a bachelor's degree, a master's degree and the university recommendation for a community college instructorship may be met without unnecessary duplication of effort and waste of time. Those interested in teaching should consult advisers in both the USC Price School of Public Policy and the USC Rossier School of Education before beginning upper-division and graduate work. Regulations governing the Master of Science in Civil Engineering permit some candidates for this degree to take 12 units outside the School of Engineering. Those who wish to do so may take 12 units in public administration. Two courses in this sequence must be selected from among PPD 500 , PPD 501a , PPD 501b , PPD 540 , PPD 541 , PPD 545 , PPD 546 . One course in this sequence must be selected from among PPD 542 , PPD 557 , PPD 666 . PPD 541 requires PPD 502x and statistics as prerequisites. PPD 546 should be taken last if elected. This program is designed to prepare competent individuals to administer the long term care needs of America's elderly population. It is jointly offered by the Davis School of Gerontology, the Marshall School of Business, and the Price School of Public Policy. For information see the USC Davis School of Gerontology . For information, see Industrial and Systems Engineering . The USC Price School of Public Policy offers the Doctor of Philosophy in Public Policy and Management (PhD), the Doctor of Philosophy in Urban Planning and Development (PhD) and the Doctor of Policy, Planning, and Development (DPPD). The PhD degrees are designed to prepare individuals for university level teaching and research. The DPPD degree is intended to develop a high level of conceptual and research competence for professional leadership in planning and development. The DPPD is administered by the Price School of Public Policy; the PhD programs are administered by the Graduate School and the faculty of the Price School of Public Policy. PhD students must consult the Graduate School section of this catalogue for regulations and requirements pertaining to its degrees. Students should also consult the Academic Policies section of this catalogue. Completion of the requirements for all these degrees is assumed to take a minimum of three years of approved graduate study and research beyond the bachelor's degree. For the PhD student, a minimum of 24 graduate units completed in residence on the University Park Campus in Los Angeles is required. DPPD students are required to complete a minimum of 24 units at the University Park Campus. Full-time study is represented by enrollment in 6 units during the semester. Usually the school and the student's qualifying exam committee insist on a clear and mutually understood commitment of time and energy by the student to ensure significant involvement in the doctoral learning experience. For university policies regarding continuous enrollment, leave of absence and readmission, see the Requirements for Graduation page. Admission to graduate standing for the PhD or DPPD is recommended by the school's admissions committee acting under guidelines established by the Graduate School as outlined in the Graduate School section and the Graduate Admission section. In addition to those guidelines, DPPD students are expected to have a minimum of five years of substantial relevant experience. Students intending to apply should direct questions about the program and all materials for the admission application to Doctoral Programs, Office of Student Affairs, RGL 111, Price School of Public Policy, University of Southern California, University Park, Los Angeles, CA 90089-0626. The deadline for applications for admission to the PhD and DPPD programs is December 1. Applications for admission are made once each year for fall semester admission. The admission decision for PhD students is made using criteria which include verification that the applicant has a bachelor's degree from an accredited college or university, has maintained a high grade point average in the last 60 units of undergraduate work, and has earned a competitive score on the verbal and quantitative portions of the Graduate Record Examinations (GRE). Other elements of the applicant's educational and experiential background are also evaluated, including performance in other advanced degrees. DPPD applicants must also provide evidence of at least five years of practical administrative or other relevant experience. The GRE and GMAT scores are neither accepted nor required for the DPPD program. Each applicant should submit the following: (1) one copy of official transcripts of all previous college and university work (be sure that these official transcripts show an awarded degree where appropriate); (2) copies of GRE scores; (3) a 1,000-word essay discussing the applicant's background and reasons for wanting to pursue a PhD degree and identifying his or her personal, educational and professional goals; (4) an up-to-date resume, including academic and professional accomplishments; (5) three letters of recommendation, two from previous instructors, the other from an instructor or from a professional supervisor or colleague. The letters should indicate the applicant's academic and professional accomplishments and potential; (6) a completed USC Graduate Admission Application, along with the nonrefundable application fee; (7) a writing sample of approximately 1,000 words (in addition to the applicant essay); and (8) a completed Price School of Public Policy Supplemental Graduate Application. International applicants are asked to submit additional information. Applicants should carefully choose, and clearly state, the degree objective (PhD or DPPD) for which they are applying, since different sets of admissions criteria exist for each of them. The application of any available transfer credits toward a graduate degree at USC will be determined by the faculty and the dean of the Price School of Public Policy, based on the semester units available for transfer as shown in the Transfer Credit Statement (determined by the USC Office of Academic Records and Registrar). Refer to Admission with Advanced Standing for more information. Admission to the university is granted for a specified semester, and it is expected that students will begin their programs during that semester. The school will normally allow students to defer their enrollment up to one year from the admission semester. Students who wish to defer enrollment should notify the school in writing no more than 30 days after the beginning of the semester of admission. Students who do not inform the school in a timely manner of their intent to defer enrollment may be required to reapply for admission. Please note that more stringent regulations apply to international students. See the Admission and Orientation section of this catalogue. Acceptance to graduate standing does not in itself imply that the student is admitted or will be admitted to candidacy for an advanced degree. Application for admission as a candidate for an advanced degree is a separate and subsequent step. See The Graduate School section of this catalogue. All international applicants for admission to doctoral programs should submit materials to Doctoral Programs, Recruitment and Admissions Office, RGL 111, Price School of Public Policy, University of Southern California, University Park, Los Angeles, CA 90089-0626. See the Admission of International Students section of this catalogue. PhD students are required to have a 3.3 overall GPA in first-year courses to continue in the program. DPPD students are required to pass a screening procedure after 16 units of course work. The procedure is designed to ensure that only those students who have demonstrated intellectual and scholarly potential continue in the program. There are differences between the screening process for PhD and DPPD students. Students should consult the relevant faculty director of the doctoral program in which they are enrolled. A qualifying exam committee assists the student in outlining an academic program leading toward the degree. Students will form an initial qualifying exam committee by the end of the first fall semester. The committee might not yet include the Graduate School representative from outside the Price School, but must include at least three tenure track the Price School faculty members, one of whom is identified as the chair. This committee bears responsibility for counseling the doctoral student, for approving a course schedule and preliminary and qualifying examinations, and for recommending the student for admission to candidacy. After approval of the student's program and proposed time schedule, the program is submitted in writing to the relevant director. This should be accomplished by the beginning of the second year, following successful screening. The complete qualifying exam committee must be in place no later than the third semester. The chair should have recognized expertise in the qualifying area and should be a regular participant in the qualifying examination committee for that area. The majority of the members of the qualifying exam committee (typically at least three out of five) should be experts in the area in which the student is qualifying and should be regular participants in the qualifying examination committee. The remaining members should have a clear interest in this area with the exception of the outside member whose primary responsibility is to serve as the representative of the Graduate School, ensuring the university's commitment to the equitable treatment of all students and that the highest quality education standards are upheld. Students will formalize their relationship with their committees through the development of a work plan which specifies all courses, degree progress, seminar attendance and what was learned from these sessions as well as a research plan that articulates major research questions being explored. At the end of the first year of study, the qualifying exam committee chair reviews and approves the work plan. At the end of the second year, the full qualifying exam committee reviews the work plan and the second year paper.